The vagus nerve runs from your brain through your neck and chest to your abdomen. The function of the vagus nerve is to control your mood, heart rate, digestion, and immune response. Stimulating your vagus nerve can help to regulate many functions in your body. Vagus nerve stimulation has been linked to treating epilepsy, improving digestive conditions, reducing inflammation, and managing anxiety disorders. It is possible to stimulate the vagus nerve through massage, exercising, singing, intermittent fasting, and taking omega-3 supplements. The traditional way of stimulating the vagus nerve is by inserting a device in your chest that sends electrical signals to the nerve. However, there are natural ways you can improve vagus nerve function with some simple stimulation techniques. In this article, you will learn about how your vagus nerve functions and how it is linked to good overall health. You will also find out how to stimulate the vagus nerve at home. The vagus nerve has an extensive function in the body and is located throughout your upper body. The long cranial nerve that is the vagus nerve connects the brain to the gut. Let’s look in more detail at how the vagus nerve functions and how vagal tone can affect your health. Your vagal nerve plays an important role in how your brain functions. Because your vagal tone is closely connected to your brain function, it is not surprising that your vagus nerve affects your mood. Stress and anxiety often cause digestive upset because of the way the vagus nerve connects the brain and gut. In some cases, stimulating the vagus nerve in the gut using probiotics could be a novel way to improve vagal tone. This can help to treat symptoms of vagus nerve dysfunction such as irritable bowel syndrome (IBS) and inflammatory bowel disease (IBD). The effect of vagus nerve function on your digestive system can also control your appetite. Other studies point to the fact that a properly functioning vagus nerve also increases feelings of satiety. Your vagal tone helps to transport signals to your brain making you feel fuller and may help prevent you from overeating. Your left and right vagus nerves are connected to most of your internal organs and help them function properly. An important reason to make sure that you have good vagal tone is to reduce inflammation in your body. 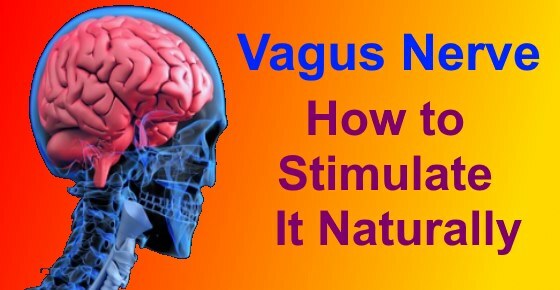 What is vagus nerve stimulation and how can improving vagal tone help regulate many body functions? Let’s look in more detail at scientific evidence on the various ways you can stimulate the vagus nerve. Splashing cold water on your face or putting a cold damp washcloth on the back of your neck can cause vagus nerve stimulation. Singing in the shower, singing in a choir, or just humming along to your favorite song can promote good health through vagus nerve stimulation. Deep breathing exercises where you consciously control air intake and output can help relax and stimulate the vagal response. Many yoga exercises involve conscious, deliberate breathing and can help to improve vagal tone. To find more, you can check out my article on the many health problems you can fix using some simple yoga poses, as well as this yoga for complete beginners. Regular physical activity is good for your cardiovascular health and to help boost vagal action. You can learn about other natural ways to improve your digestive health if you have constipation or other digestion issues. You can help to resolve many of the symptoms of vagal dysfunction by taking probiotics to improve your gut’s microbiota. There are many studies showing that probiotics can help to boost your digestive health. Part of the reason why probiotics are good for your digestion is that they stimulate your vagus nerve. Find out about the many reasons to take probiotics regularly and which type of probiotics helps restore gut flora after taking antibiotics. Taking fish oil supplements can help to increase vagal activity and have a positive effect on your cardiovascular health. There are plenty of studies showing how omega-3 capsules can help to keep your heart healthy, reduce inflammation, and positively affect your mood. One of the benefits of having a massage to help you relax is that it helps to increase vagal activity in your body. Devices designed to stimulate the vagus nerve are sometimes used to control epilepsy seizures. However, massaging the carotid sinus on the sides of your neck can have a similar effect. Find out about the best essential oils to use in a relaxing massage to help bring your stress levels down. Massaging your feet benefits your general well-being because it is another way to stimulate your vagus nerve. If you are interested in reflexology, please read my article on how to do reflexology at home to cure many ailments. One way to stimulate your vagus nerve naturally and benefit your heart rate variability is to fast intermittently. Intermittent fasting is sometimes called the 5:2 diet. This involves eating normally for 5 days and then on 2 non-consecutive days having a partial fast. Calorie intake for the fasting days should be 500 calories for women and 600 calories for men. If you want to lose weight quickly, learn about the benefits of intermittent fasting to help shed pounds of body fat. Find out what other natural ingredients help to boost levels of serotonin. One way to improve vagus nerve function is to perform progressive muscle relaxation. To perform progressive muscle relaxation to stimulate your vagus nerve, start by tensing the muscles in your feet and holding for 10 seconds, then releasing them. Repeat this for each muscle group as you work your way up your body. Do this for 20 minutes each day to benefit from increased vagus nerve stimulation.